While most Akron homeowners don’t like to think about it, there is one place that all of the waste from each of your plumbing fixtures goes. That ‘one place’ is the main sewer line and it is buried in the ground outside of your home. In other words, there is a pipe running through your yard right now that is carrying all of the food scraps, shaving cream, grease, used water, and human waste that was generated by your household today. The old adage ‘out-of-sight, out-of-mind’ sums it up perfectly. Unfortunately, out-of-sight isn’t always the case. In fact, when your sewer line becomes ‘in-sight’, it means that you have a serious plumbing failure on your hands. As you can imagine, due to the very sensitive materials that your sewer line carries, a sewer line failure spells disaster! For thousands of homeowners each year, this is a very real scenario. They wake up in the morning or come home in the evening to find that their sewer line has failed and their yard is flooded with raw sewage and used water. 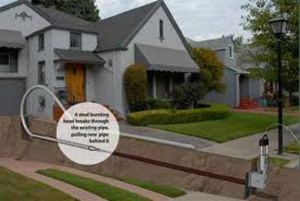 Thankfully, for the homeowners of Akron, just one telephone call to The Trenchless Guys will get the situation resolved efficiently and professionally. Our team is proud to offer the latest in sewer line repair technology by providing our clients with trenchless sewer line pipe relining and pipe bursting. Why Should I Choose Trenchless Sewer Line Pipe Repair? Trenchless sewer line pipe relining and pipe bursting is the most current sewer line repair technology available. It requires special training and high-tech equipment. Both of which our team is highly experienced in. In the past, if you had a sewer line failure you had to hire a plumbing team to come in with excavators and backhoes to dig large trenches in your yard to locate the problem. Not only did this approach leave the homeowner with a serious mess to clean up after, but it took longer and cost more! ● Less expensive. A trenchless sewer line pipe relining and pipe bursting approach to sewer line repair is much less expensive than the traditional approach. It requires fewer people on the job and virtually zero heavy equipment to hire. ● Cleaner. A sewer line failure is messy enough without a sewer line repair project adding to the mess. With a trenchless sewer line pipe relining and pipe bursting approach, there is no digging. So, you don’t have to worry about repairing or replacing any of your landscaping, driveway, or patio once the job is over. Call The Trenchless Guys today to discuss how we can help with your sewer line repair job. The homeowners of Akron have trusted us for more than 20 years with a variety of plumbing related tasks. We specialize in trenchless sewer line pipe relining and pipe bursting and have dedicated years of training and experience. Our company is family-owned and operated and we are proud to be members of this beautiful community. We pride ourselves on treating each of our clients as if they were family and friends – because they are! If you notice signs of a sewer line breakdown – don’t hesitate! Give us call as soon as possible so that we can provide you with the excellent customer care and upfront pricing that you need to get your system back up and running!